Pure and Natural white cheddar Angie's kettle corn. Seedless green and red grapes with ghost pick. Haunted house sandwich with pretzel windows and bread crust roof. 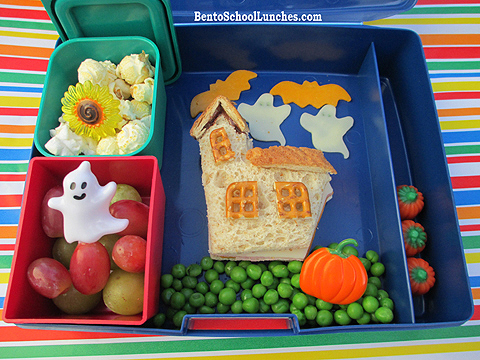 Organic peas, colby bats and provolone ghost with food safe marker eyes. Far right are Brach's pumpkin candies. Packed in Laptop Lunches. Super cute! I love your pretzel windows! LOVE this Rina, SO CUTE! I love this!!! Awesome Haunted House!! Thanks Ming! :-) Pretzels are so easy to add to accents and I sometimes forget to use them. A cute haunted house!!!! Yes, I love it! Super creative Rina! I have a question about the Amazon links you have at the end of this post. I am an Amazon associate member but I can't figure out how to add the products I've used to my posts. Where did you get this widget? My blog is on Blogger if that makes a difference. Thank you! Thanks for stopping by Anna! The widget is from your amazon associates page, click on 'links and banners', click on 'product links' which is same row as home. There is a search box , key in the keyword and the product will pop up. Click 'get link' on the product and copy paste the html code to your blog. I hope that helps.